Molten Strike is an attack skill consisting of two parts: an initial melee attack hit and a projectile attack. This build is easily started at the beginning of league and starts out cheap and powerful with extreme end game scaling available with investment as the league goes on. 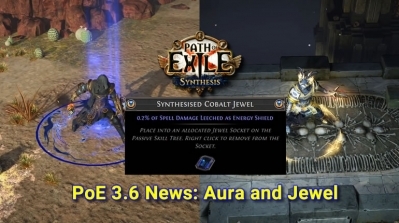 From mew information of 3.6 version of the official, we find a new jewel, which comes with 0.2% of spell damage leeched as energy shield. It is a built-in mod. This build uses Cyclone to summon and activate powerful minions. With Cyclone, you attack 6.16 times per second. The only somewhat annoying map mod for the build is physical reflect as your relics will one-shot themselves. This POE 3.6 Synthesis Essence Drain Contagion Trickster Build have insanely high exp/h gain and allows you to level as itself without any external abilities required, also can can start with a very low budget with possible upgrades for higher currency. Arc is a lightning, chaining spell with highest amount of chains in the game. Chain means it will "zap" between enemies. We will use Arc+Trap in a shaper 5L gloves for clearing maps and 8 second fat Lightning Spire Trap in a 6L for bosses. If you a new players and are having no issues with currency and are getting a fair level of gear, this build can help new players to clear all content even though the playstyle may seem rough at first. With this POE Synthesis Double Strike Champion Build, you can just alc-and-go for all maps and endgame content, except no leech. We're using ancestral call and melee splash for clear, so our clearspeed is pretty good. Arakaali's Fang can 100% chance to Trigger Level 1 Raise Spiders on Kill, An interesting Build can be accomplished using this mechanism,This Scion Build Can complete all maps, not affected by the special affix of the map, endgame without saying anything, low cost, fast map clearing. Displaying 25-36 of 494 results.